Cali’Flour Foods Cauliflower Pizza Crust with topped tomato sauce, arugula & tomatoes tossed in a lemon vinaigrette and dollops of ricotta. That’s it! Beyond easy, fresh and DELISH! And it literally takes 10 minutes to make. 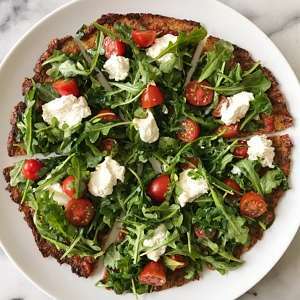 While the pizza crust heats up in the oven, heat up some tomato sauce (either homemade or prepared), whisk together the vinaigrette and toss with arugula and tomatoes. Top pizza crust when it comes out of oven. Voila! That’s why we love Cali’flour Foods crusts so much! Made with only a few ingredients, it tastes homemade, has a great texture and such a time saver. They have 3 varieties — an Original Italian Cauliflower Crust, Sweet Red Pepper Cauliflower Crust and a Plant-Based Italian Cauliflower Crust. And they are naturally gluten-free. You can use Affiliate code “healthyGFfamily”* for 10% off any order over $50 at califlourfoods.com . Happy pizza making! This fresh 10 minute pizza that's a weekday win! Cali'Flour Foods Cauliflower Pizza Crust with topped tomato sauce, arugula & tomatoes tossed in a lemon vinaigrette and dollops of ricotta. Beyond easy and DELISH! Bake Cali'Flour pizza crust for 7-10 minutes. While crust bakes, heat up tomato sauce in a small sauce pan and whisk together vinaigrette ingredients. Place arugula and tomatoes in a large bowl. Toss with vinaigrette to taste. Top heated pizza crust with warmed tomato sauce, leaving a ½ in edge. Top with arugula and tomatoes. Top with dollops of fresh ricotta.